I love swiss chard and our local organic box always sends us some in the winter. My standby is to steam it with butter and garlic, but that's what I do with all green leafy vegetables, and it does get boring after a while. Enter this recipe from Simply Recipes (courtesy of Punchfork). It's basically the same, but pan fried instead of steamed. Gives it a nicer texture. I kept the crushed peppers on the side because Yelena hates 'em but I love 'em. 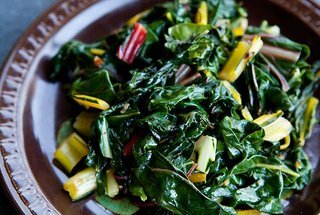 Not a spectacular recipe, but I'm definitely going to keep this one in my back pocket for the next time I get chard.